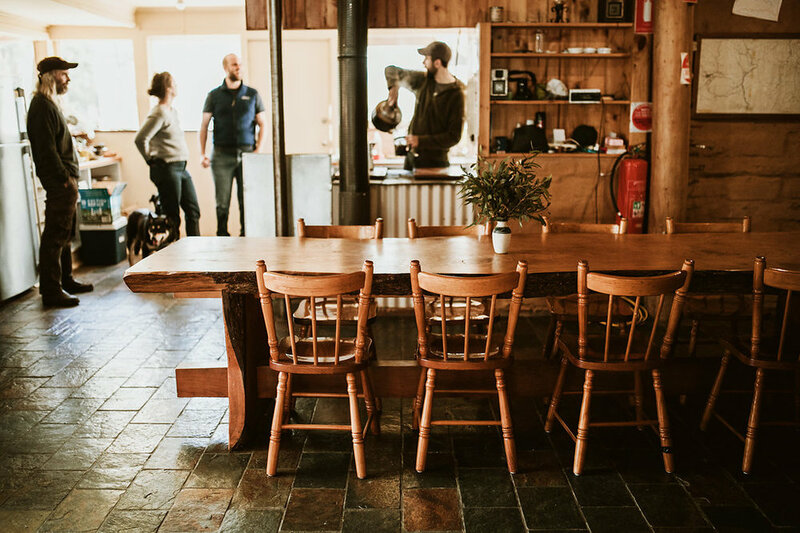 Your accommodation at Glen Wills is a warm, cosy and spacious self-contained homestead of 10 bedrooms and 6 bathrooms, plus living space with wood stove and a fully-equipped kitchen. Outdoors, there's a woodfired pizza oven, BBQ and fire pit to get outside and enjoy the natural environment. The homestead is 2 storey - there are 5 bedrooms upstairs and 5 bedrooms downstairs. The downstairs bedrooms all have their own ensuites, and each room has 3 beds - a double bed and a single. The upstairs bedrooms share a bathroom and each room has 2 single beds. 20 guests are comfortably accommodated, but spare mattresses are available if you have a bigger group! Snuggle up by the fire on the comfy couches, play boardgames or read a book. Gather around the long table for lazy lunches and feast dinners after working up an appetite in the fresh mountain air. If you're keen to cook for yourselves, there is a kitchen in the homestead. If you want to just kick back and relax, Gordy is a great cook and offers fully catered stays with advance notice. With 10 comfortable bedrooms, 5 upstairs and 5 downstairs, the homestead comfortably sleeps 20. For larger groups BYO bedding is preferred. Additional mattresses are available for groups above 20 guests. The best spot to chill out as the sun goes down with a cold beer or glass of wine. Keep your eyes out for wildlife in the clearing in front of the deck! Light the pizza oven and enjoy delicious home-cooked wood fired pizza! On a clear night sitting around the firepit, looking up at the stars and toasting marshmallows is a great way to spend an evening. Contact Gordy on (03) 5159 7254 or click below for availability. Peak times including school holidays and Easter book out quickly, but there's something to do all year round at Glen Wills, so it's always worth getting in touch about your upcoming holiday. $20 per head subsequent nights. Glen Wills is the kind of spot you can easily spend a week or more. Discounts available for long stays and repeat customers - get in touch if this applies to you! Whether you are looking for a fully catered holiday or just a special meal on one night of your stay, get in touch for pricing and menu options. Please note that catering needs to be booked in advance to allow enough time to purchase the food and make preparations.